On February 24, 1582, Pope Gregory XIII introduced a new calendar, eventually named after him, that most of the world still uses today. 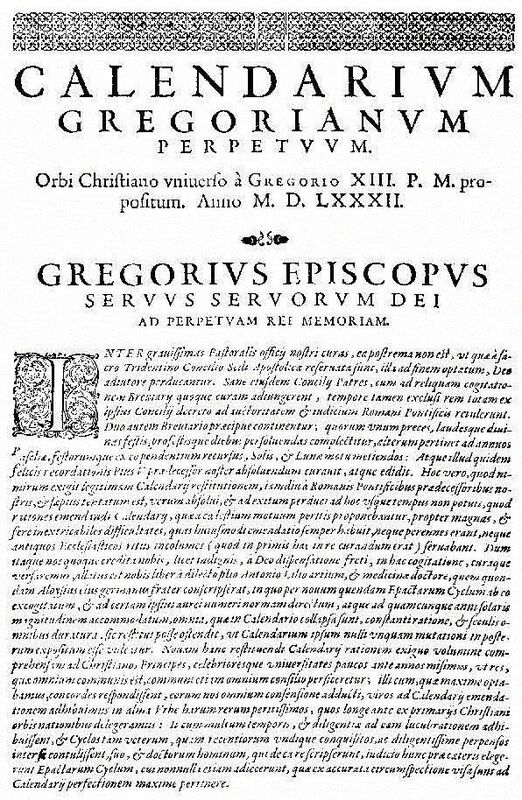 The first page of the papal bull "Inter Gravissimas" by which Pope Gregory XIII introduced his calendar. On February 24, 1582, Pope Gregory XIII introduced a new calendar for use in the Catholic Church. Today, the Gregorian calendar is the most widely used calendar in the world. The Gregorian calendar is a 400-year cycle where each year is about 365.2425 days. The calendar is notable for its “leap years.” Leap years are an extra day in February. Leap years are added every four years, in years divisible by 100 and by 400. So, 1900 was not a leap year, because it is not evenly divisible by 400. The next 4-year cycle not being a leap year will be the year 2100. Other calendars are more accurate than the Gregorian calendar. The Persian calendar, the official calendar of Iran and Afghanistan, requires fewer adjustments (such as leap years). Regardless, the Gregorian calendar remains the standard civil calendar in the world today, used by such international organizations as the United Nations. device for bringing something into general compliance or use. having to do with the ordinary life of a citizen, as differentiated from military, legal, or church-related concerns. owner of an area of land where others occupy space and pay rent. leader of the Catholic Church. payment for use of a piece of property for a certain amount of time, usually a month.